Tigers Maintain Top Spot With Victory Over Sutton. Hexagon Telford Tigers 1 travelled to Ice Sheffield on Saturday night to take on Sutton Sting in the NIHL Moralee Division. Tigers had hit top spot in the league last weekend after beating Solway Sharks 6-5.Tigers had beaten Sutton 10-2 the last time the teams met with Doug Clarkson scoring a remarkable five goals. Tigers knew ahead of face off that this game presented an opportunity to increase the lead at the top of the league with second placed Sheffield’s game against third placed Hull being postponed due to issues with the ice surface. Tigers lined up without Dan Mitchell and Jason Silverthorn through injury but were able to add Joe Hazeldine after he returned from international duty. In goal for Tigers was Tom Hovell and for Sutton Warren Gilfoyle. Sutton have improved as a team this season and the first period saw a close game and only two goals. Tigers took the lead in the 10th minute, Doug Clarkson scoring from a pass from Scott McKenzie. Six minutes later, McKenzie scored for Tigers after being set up by Ricky Plant. Tigers ended the period with a narrow lead. The second period saw Tigers score goals at will. In the 24th minute, Jack Watkins scored Tigers’ third goal and was closely followed by goals from Brodie Jesson and Andy McKinney to increase the lead to 5-0. As the game reached the half way stage, McKenzie added his second of the night for Tigers’ sixth goal. Joe Aston then added a seventh goal after being set up by McKenzie and Plant. With the assist of Aston’s goal, McKenzie took his total of points for the evening to six! Hovell’s shut out bid was ruined in the 35th minute after Sutton’s Dominic Martin scored from close range to get Sting on the scoresheet. As the period reached the final minute, Jonathan Weaver scored Tigers’ eighth goal to end the period in complete control of the game. The third period saw four more goals, with two goals scored by each team. In the 48th minute Adam Taylor scored Tigers’ ninth goal. Sutton hit back with a goal from Kieron Brown, before Clarkson added his second of the night for Tigers’ tenth goal. The final goal of the game was scored as the game entered the final two minutes with Sutton’s Craig Elliot registering Sutton’s third goal. Tigers’ win puts them three points clear at the top of the league ahead of their game with Whitley Warriors at Telford Ice Rink on Sunday. 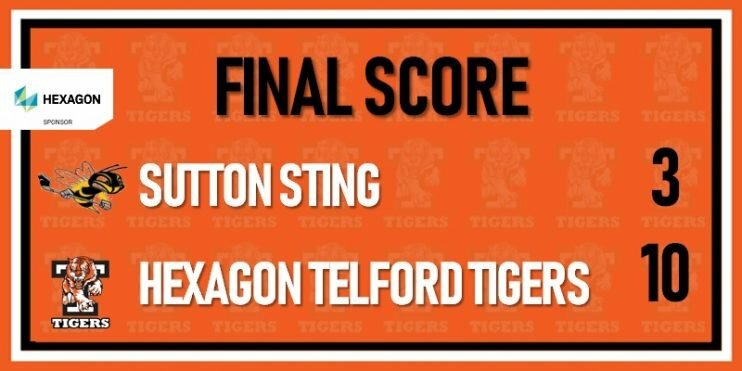 Final Score: Sutton Sting 3 Hexagon Telford Tigers 10. Scorers: Doug Clarkson (2), Scott McKenzie (2), Brodie Jesson, Jack Watkins, Andy McKinney, Jonathan Weaver, Adam Taylor and Joe Aston. After the game coach Tom Watkins commented, “We scored some good goals tonight and really started to play in the second period and moved the puck well. We really have got to improve on our play away from the puck and make sure we’re tough to break down. Defensively we can get better and play with more commitment to our defensive responsibilities. We gave up some soft goals last week against Solway and shouldn’t have conceded three this evening. Hexagon Telford Tigers 1 return to play at Telford Ice Rink Sunday 27th January 2019 at 18:00 in the NIHL Moralee Conference against Whitley Warriors. Hexagon Telford Tigers 2 are next in home action at Telford Ice Rink on Saturday 9th February 2019 at 19:00 in the NIHL Laidler Conference against Coventry Blaze NIHL. For details of all future fixtures, check out the Tigers fixture list and www.telfordtigers.net/tickets for ticket information.